At Burbank Middle School, students are creating videos about their future and life goals using Adobe Voice. At Herrera Elementary, students are using tablets and digital programs such as iMovie, Animoto, Prezi, and Roxio to produce digital book trailers instead of a standard book report. And at Austin High School, teachers are using the HUB, the district’s new online learning platform, to create online discussions and group activities. Every day, students and teachers across the district are using digital tools and resources to transform teaching and learning inside their classrooms. Recently teachers and students from nearly 50 HISD campuses gathered in the lobby of the Hattie Mae White Educational Support Center to showcase their efforts at the district’s first ever Digital Learning Expo. This entry was posted in PowerUp and tagged Burbank MS, digital learning, Herrera ES, PowerUp HUB on March 13, 2015 by HISD Communications. Every day, students and teachers across the district are using digital tools and resources to transform teaching and learning. On Friday, March 13, HISD teachers and students will share on social media how they are using technology in the classroom using the hashtags #HISDdigital and #DLDay as part of national Digital Learning Day. This entry was posted in PowerUp and tagged digital learning on March 12, 2015 by HISD Communications. At Burbank Middle School, students are creating videos about their future and life goals using Adobe Voice (see video below). At Herrera Elementary, students are using tablets and digital programs such as iMovie, Animoto, Prezi, and Roxio to produce digital book trailers instead of a standard book report. And at Austin High School, teachers are using the HUB, the district’s new online learning platform, to create online discussions and group activities. Every day, students and teachers across the district are using digital tools and resources to transform teaching and learning inside their classrooms. On Thursday, March 12, from 4 to 5 p.m., teachers and students from nearly 50 HISD campuses will gather in the lobby of the Hattie Mae White Educational Support Center (4400 W. 18th St., 77018) to showcase their efforts at the district’s first ever Digital Learning Expo. This entry was posted in 21st century schools, District I - Elizabeth Santos, PowerUp and tagged Burbank MS, digital learning, PowerUp HUB on March 11, 2015 by HISD Communications. During the month of February, all HISD teachers are being encouraged to try something new in their classrooms, as well as share ideas, resources, and lessons learned by posting their experiences and photos on social media using the hashtag #HISDdigital. Each week during the month, we are profiling a teacher or campus that is using technology to break up rows in classrooms, engage students, and innovate instructional practice. This week’s profile features Herrera Elementary. This entry was posted in District VIII - Diana Dávila and tagged digital learning, Herrera ES on February 16, 2015 by HISD Communications. During the month of February, all HISD teachers are being encouraged to try something new in their classrooms, as well as share ideas, resources, and lessons learned by posting their experiences and photos on social media using the hashtag #HISDdigital. Each week during the month, we are profiling a teacher who is using technology to break up the rows in their classrooms, engage their students, and innovate their instructional practice. This week’s profile features Austin High School teacher George Caldwell. Veteran social studies teacher George Caldwell admits that when he first heard about PowerUp, HISD’s districtwide digital transformation effort, he was a little nervous and scared. A year later, all of Caldwell’s students at Austin High School have their own laptops, and he is much more comfortable using technology in his daily instruction. He’s also embraced the PowerUp:HUB, HISD’s online teaching and learning platform, as a way to facilitate student discussion and collaboration in his classroom. This entry was posted in District VIII - Diana Dávila, PowerUp and tagged digital learning, hub, powerup on February 5, 2015 by HISD Communications. High school teachers from throughout the district are spending their Saturdays and early-release training days learning how to integrate web tools and digital content into their daily classroom instruction. The training is part of PowerUp, a districtwide program that is giving students their own laptops to use at school and at home. 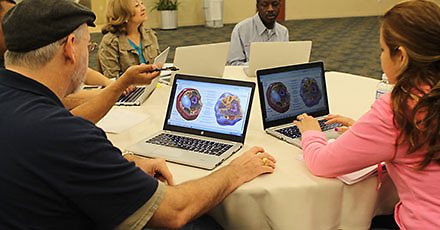 HISD’s Professional Development and Instructional Technology Departments are co-hosting the training sessions, which are designed to give teachers hands-on instruction and guidance on how to use technology to make their lessons more engaging and student centered. This entry was posted in High Schools, PowerUp and tagged digital learning, powerup on October 15, 2013 by HISD Communications.